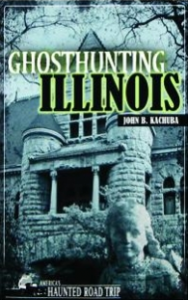 In today’s post, John Kachuba, author of Ghosthunting Illinois, tells us about the 1915 sinking of the Eastland in the Chicago River. 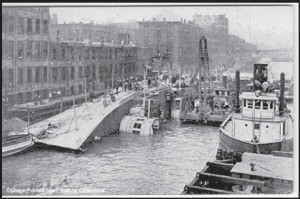 One of the most tragic maritime disasters in U.S. history did not occur on the storm-tossed seas of the Atlantic or Pacific Oceans, nor was it the result of monstrous icebergs, killer storms, or enemy torpedoes. No, there was nothing dramatic in the death of the steamer Eastland except that it slowly rolled onto its side on the Chicago River, in the heart of that city, in plain view of thousands of people, killing at least 844 passengers and wiping out 22 entire families. The disaster occurred in water no more than 20 feet deep and only a few feet away from dry land. Today, these unfortunate victims haunt the stretch of the Chicago River between the Clark and La Salle Street bridges. Witnesses have seen faces peering up at them from the watery depths of the river and have heard unexplainable screams and cries emanating from it. And it could be that the ghosts of the Eastland roam even farther into the city. Saturday, July 24, 1915, dawned as a partly cloudy day in Chicago. The Eastland was one of the newer ships gathered at the docks that day. Rumors had circulated among the steamship lines that the Eastland was top-heavy and less than stable, but those thoughts were disregarded as passengers began to stream aboard at 6:40 a.m. Only 1 minute later, the ship began to list starboard, toward the docks. As more passengers crowded onboard, the Eastland began to list to the port side, where many people had congregated to watch the other ships boarding. The ship continued to sway back and forth, some of the passengers joking about it as loose objects slid along the deck. Water began entering the Eastland on the lower port side. The gangplank had been removed from the overcrowded ship, which now held more than 2,500 passengers. The crew began to worry and started to move some of the passengers to the starboard side. Water continued to enter the ship from below. Passengers below deck began climbing out of gangways and windows on the starboard side as the ship continued to lean toward port. The passengers panicked. The ship continued to list dangerously to port. Before the eyes of hundreds of horrified spectators on nearby streets and docks, the Eastland slowly rolled over onto its port side. Many passengers were pitched into the Chicago River, where, encumbered by suits and long dresses, they were pulled below the water. Many more were trapped below, where they drowned. Some were killed by the thick smoke that filled the ship when some of its machinery exploded. Lucky survivors managed to climb onto the hull of the ship, while others were pulled from the river by rescuers in boats and even by onlookers who jumped into the water to save the floundering passengers. Others struggled to stay afloat and clung to whatever floating debris they could find. Policemen, firemen, and other rescuers climbed onto the hull of the Eastland, where they cut holes in the metal plate to bring up the survivors and the dead. Screams echoed all around them from the river and those trapped below deck. They worked frantically to free those inside, but the screams gradually diminished even as they worked. By 8 a.m. all the survivors had been rescued, but 844 bodies were pulled from the ship and the river. 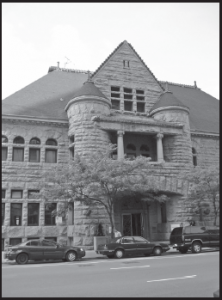 The Second Regiment Armory on Washington Boulevard was pressed into service as a temporary morgue. The original armory building was incorporated into what became Harpo Studios, which produced the Oprah Winfrey Show. It is said that the ghosts of the Eastland victims are not at peace in the building. According to Chicago ghosthunter Dale Kaczmarek, one common apparition is the Lady in Gray, the shadowy figure of a woman in a long, flowing dress and ornate hat who is seen drifting through the halls. Supposedly, her image has even been captured on the building’s security monitors. In addition to the Lady in Gray, studio employees and security guards have reported hearing crying, the laughter of children, and old-time music. The footsteps of crowds of invisible people are heard going up and down the lobby staircase, accompanied by opening and slamming doors. Another location that ghosts of the Eastland are rumored to haunt is Excalibur, a nightclub housed in the Romanesque-style brick building originally constructed for the Chicago Historical Society in 1892. Some people think that Eastland victims were also brought to the Historical Society, as well as the armory. In 1997, a segment of the television show Sightings was filmed at Excalibur, featuring host Tim White, a local ghosthunter, and a psychic. The psychic heard a child’s voice say, “Stop and watch me.” Excalibur employees have heard small voices, like children, crying and have seen a little girl looking over the railing in the club’s Dome Room. Adult figures have been seen in the club, as well, including a white-tuxedoed figure and a bluish-colored shape that floats up the stairs.